One of the most unique attractions in the Branson area is the Shepherd of the Hills Fish Hatchery. Located six miles outside of Branson, the hatchery is the largest trout production facility in the Missouri Department of Conservation’s trout production program and produces an astounding 1,125,000 catchable trout each year weighing a total of 301,000 lbs.! 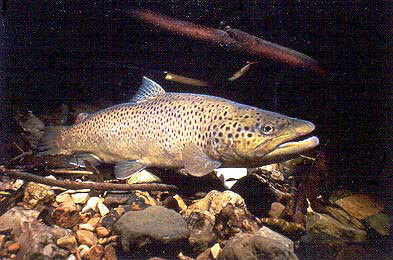 The majority of the hatchery’s fish are rainbow and brown trout and are distributed to area lakes such as Lake Taneycomo, which receives 700,000 of the swimmers each year. Contrary to what you might think, you don’t have to be an avid fisherman to enjoy a trip to the Shepherd of the Hills Fish Hatchery. It’s perfect for both family fun and educational adventures! Occupying 211 acres of land, the hatchery is visited by approximately 250,000 people every year who take part in guided tours or explore self-guided routes. Official tours are conducted four times a day on weekdays from Memorial Day to Labor Day, and each tour offers visitors educational and entertaining information regarding the process and importance of raising fish. Not only do they see all phases of the hatchery’s fish production, which extends from egg incubation to full development, they also are able to take part in hands-on activities such as feeding the fingerlings! Beyond the hatchery’s actual facilities, the area also boasts four nature trails and live animal displays featuring snakes, frogs, spiders and turtles that are native to the area making it the ideal location for a day of family exploration through the nature of the Ozarks. Bring your walking shoes and camera, and you and your family will be set for an excursion that you’ll never forget! The hatchery is open from 9:00 a.m. to 6:00 p.m. from Memorial Day to Labor Day, but it remains open year-round with shorter hours. Located on Highway 165 just south of Branson, the hatchery and conservation center are easy drives for all Branson vacationers. This summer, while you’re enjoying one of our Stay in Branson vacation properties, why not schedule a trip to one of the area’s most fascinating destinations? Discover the Shepherd of the Hills Fish Hatchery and treat your family to a dose of fantastic fishy fun!